The wrapper is a marbled mix of darker browns. There are a couple of slightly raised veins and while the seams are easily visible, they are smooth. The head is finished off with a well applied triple cap. There are two bands, the first being the traditional design for the brand in red with gold borders and white lettering. 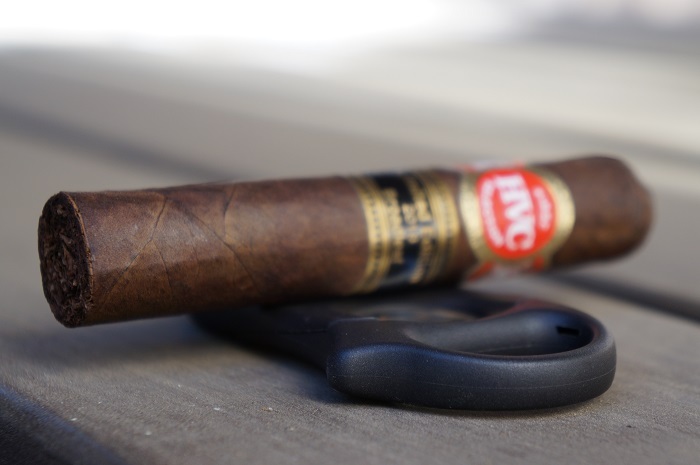 The secondary band is similar to the Habanos design for Edicion Limitadas. 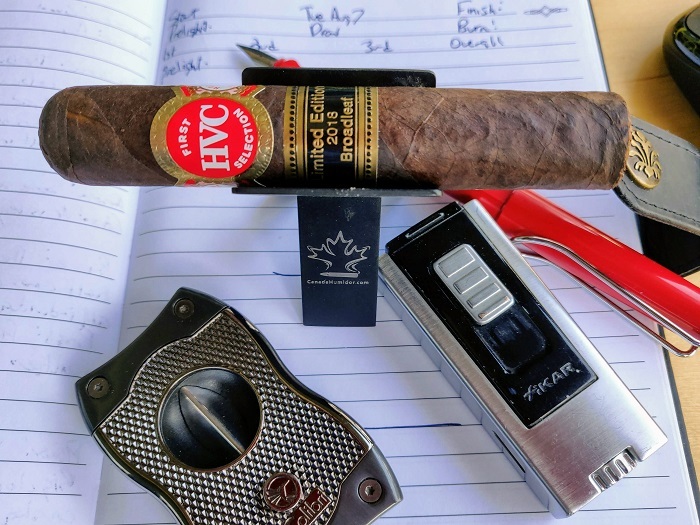 The aroma from the wrapper is a mix of wood and light barnyard notes while the foot brings more wood along with some tobacco sweetness and white pepper. The pre-light draw is a nice creamy mix of wood and leather with a slight spicy tingle on my tongue. 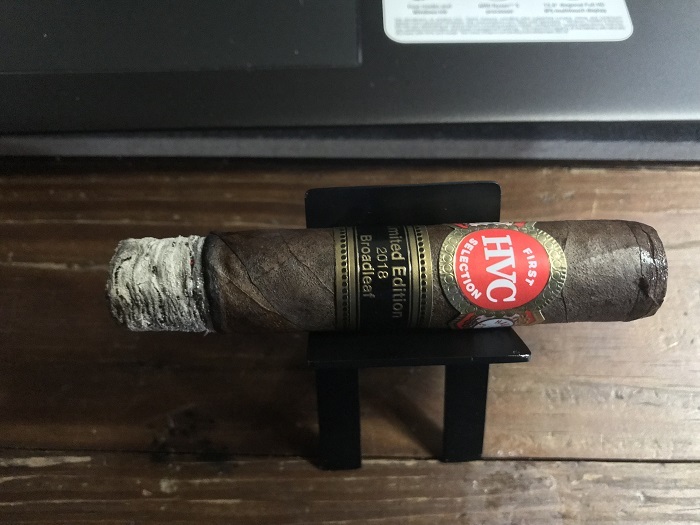 The HVC First Selection Limited Edition 2018 Broadleaf Short Robusto has a solid maduro wrapper. It has a nice chocolate brown coloring and it had some variations in shades to it. There is quite a bit of tooth present in the wrapper along with some medium to small sized veins. You can feel the tooth in the texture and it is firm with a faint oily texture present. 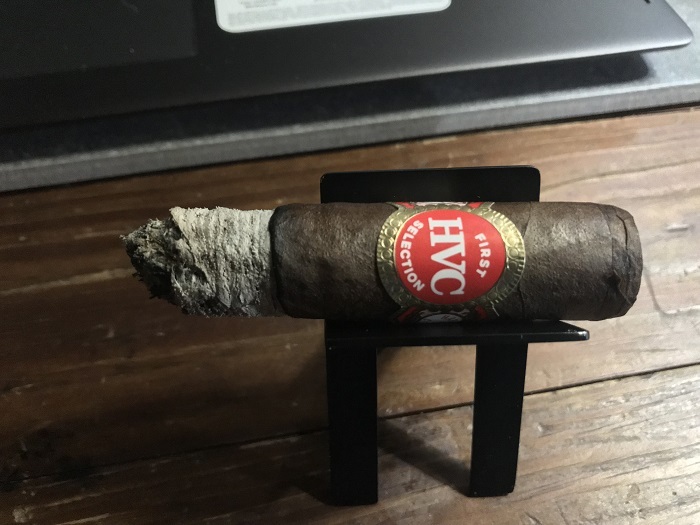 There is a nice triple cap applied to the cigar and it is a well constructed Robusto. The foot of the cigar is giving off an aroma of rich earth, strong spices, chocolate and dry wood. The wrapper is showing rich earth and leather notes and there is a perfect cold draw that is delivering a lot of richness. 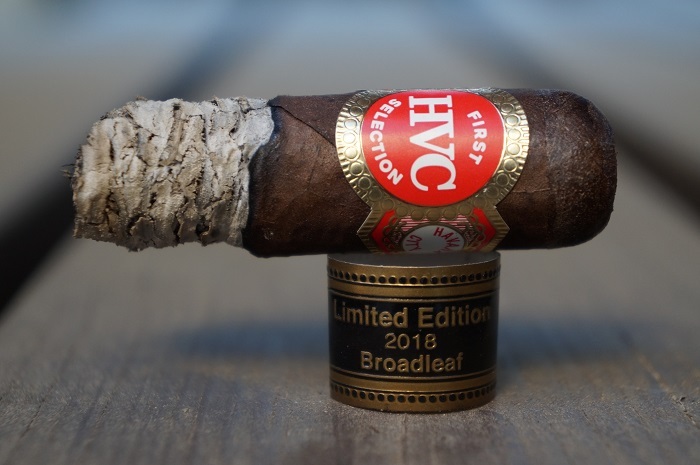 The HVC First Selection Limited Edition 2018 Broadleaf Short Robusto (FSLEB) has a red and gold embossed band with a secondary ‘Limited Edition 2018 Broadleaf’ band. The wrapper is quite dark with firmly pressed veins. Nosing the wrapper, I get intense leather, barnyard and spicy cedar. In the foot, I’m smelling mild hay and sweetness. The cigar begins with some dark and heavy wood along with a complimentary black pepper. At a half inch in, this powerhouse is still running strong with the dark and heavy wood as the black pepper has picked up a bit. At an inch in, some cream joins the profile and smooth things out and lightens the wood. The retrohale is a creamier version of the profile. As the third comes to a close, both the dark wood and black pepper are assisted by the cream. The strength in this third was medium-full. The first third opens up with a blast of black pepper and it is paired with this rich earth, toasted almond, oak and toast quality. It is very rich, filling and full in strength at the same time. 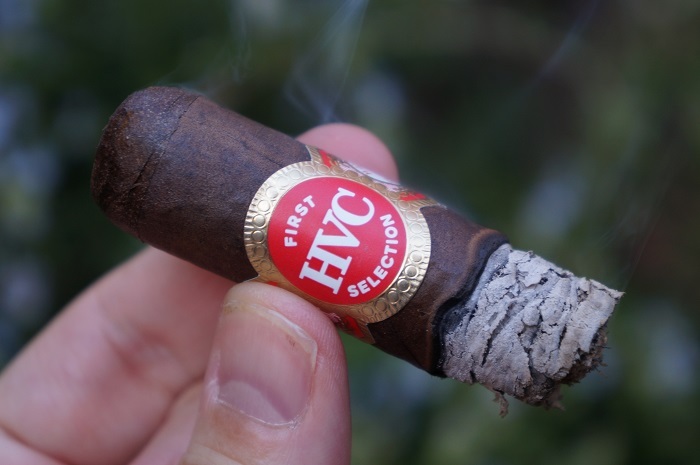 It is a great Broadleaf wrapper over a Nicaraguan tobacco blend, and exciting to see from HVC. There are some jammy and currant notes present as well and it is complex. As I said just now, it is full in body and strength and the flavors are full as well. There is a lot going on with this cigar in the first third! The FSLEB opens with flavors of honey, and rich spices on the retrohale. I’m immediately surprised by just how much smoke production there is with each draw. A few more puffs and the cigar reveals lingering leather and cedar on the post draw. With each puff the spices on the retrohale rapidly intensify. Normally I’m not a big fan of leather flavors in a cigar but the post draw leather here is enjoyable and not overwhelming. As the FSLEB settles in at the 10 minute mark, some creaminess joins in, as the spices finally hit peak values and start to recede. The post draw palate is a pleasant creamy cedar and leather that coats the tongue between each puff. As the second third begins, the cream lightens up a bit, bringing the dark and heavy wood back to the front. The black pepper has receded some and is now more of a finish component. At three quarters of an inch in, some coffee joins in with the dark wood and slight cream. As the third comes to a close, the dark wood gains some char to go along with the light coffee and cream. The strength in this third dropped down to slightly above medium. When I get into the second third of the cigar, I find there is some transitioning in the flavor profile. The currant notes have taken a much bigger presence, as has the jammy profile and it is showing this dried blueberry profile. It is paired with some dark chocolate notes and with that is some wood, black pepper, espresso bean and toastiness. As before, it is full in body and strength and full flavored. It is still smoking great and as I said before, this is a fantastic Broadleaf release with Nicaraguan tobacco. No transitions as the flavors remain consistent and balanced at a medium minus strength level moving into the middle third. The leather and spices continue to be exceptionally balanced, as the honey moves to the end of each puff. As the final third begins, the char has reduced a bit while the dark wood is still up front supported by some coffee and cream in the background. At a quarter inch in, the char picks back up. At a half inch in, the char is steadily on the rise. The retrohale is fairly creamy and also presents the dark wood and coffee notes. 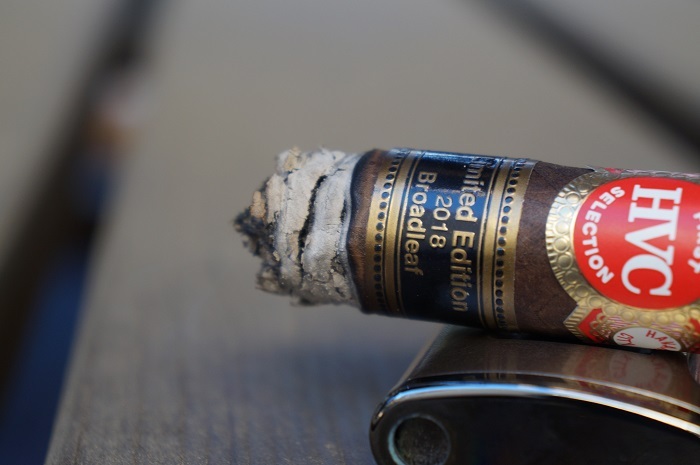 As the cigar comes to a close, the profile consists of charred, dark wood along with some coffee and cream. The strength in this third remained at slightly above medium. When I get into the final third, I find the flavor profile gets darker and richer and it is focused on dark chocolate notes, espresso beans, toast, rich earth and dry wood flavors. There are some faint dry blueberry notes present, but they are not what they were in the second third or showing those jammy qualities of the first third. It finishes off full in strength and body, and the flavors are right there as well. Leather starts to take over the flavor profile moving into the final third. As the final third establishes itself, there are some rich woody notes coming through on the post draw that leaves a bit of drying mouthfeel. Some earthy chocolate comes through with trailing pepper as the last third settles in. The spices on the retrohale continue to evolve into rich baking spices. By the time I’ve finished the cigar, the nicotine strength is up to medium-full. The burn was slightly wavy and never needed any attention. The ash held on in inch and a quarter increments. The burn is perfect throughout, and this is a well constructed cigar. The burn line is razor sharp and on the end is a firm medium shade of charcoal colored ash. 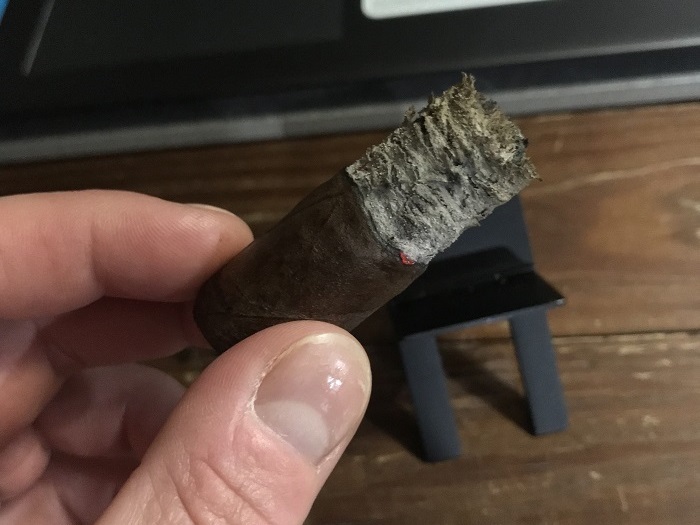 The ash probably could have held onto the halfway point, but I tapped it after each third and when getting to the bands. 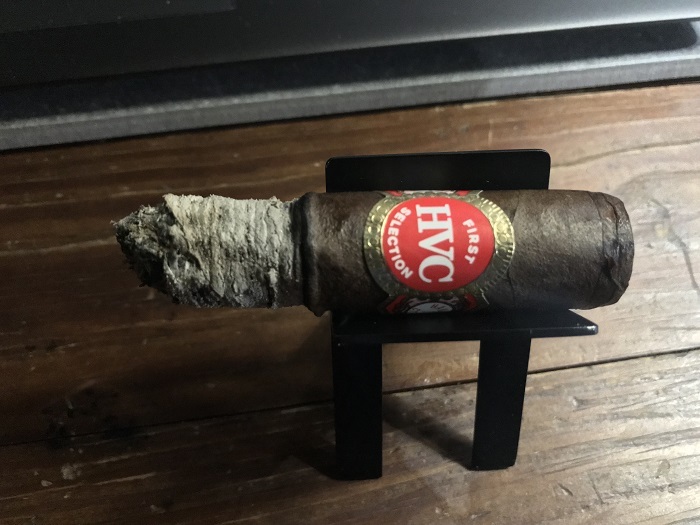 The HVC First Selection Limited Edition 2018 Broadleaf Short Robusto has a wavy burn throughout, with the ash holding on well in 1+ inch increments. Touch-ups are required in the first and middle third. 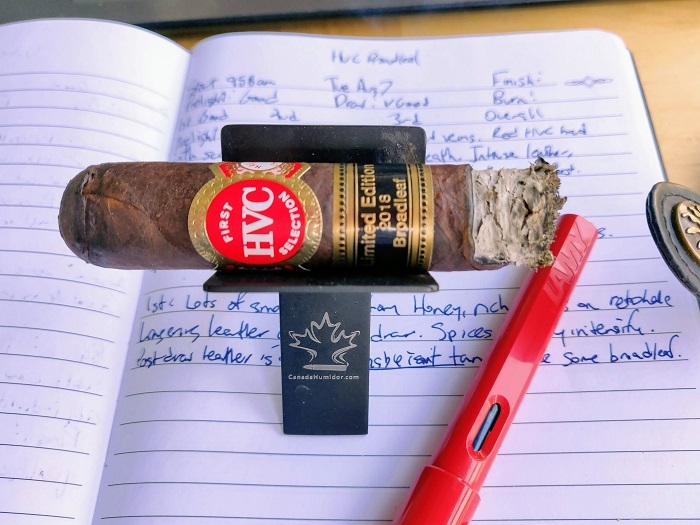 The cigar started very dark and with a lot of strength but smoothed out about the one inch mark as some cream came in to settle down the dark wood and black pepper. Some coffee joined in later as the black pepper faded away. Construction was fantastic and needed zero attention. 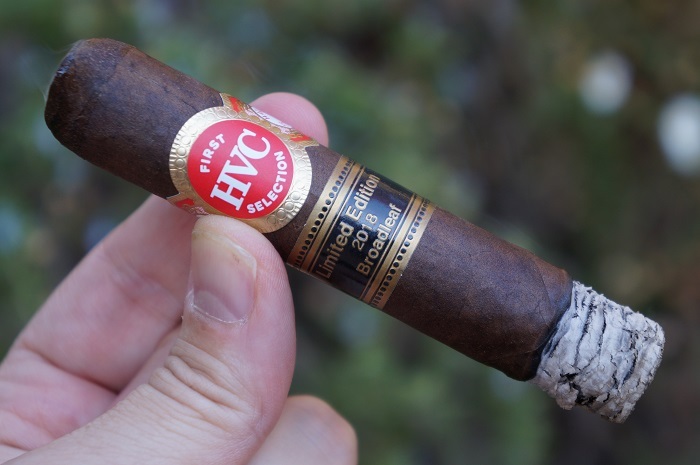 I was eager to smoke this cigar as it’s HVC’s first line with a Broadleaf wrapper and I wasn’t disappointed. If you like a darker flavor profile with the strength to match, you’ll want to track these down. I’m looking forward to smoking more of these as a nice after dinner cigar. Like the burn, the draw was amazing. It was to my liking and presented no problems throughout. A nice bit of smoke was produced with each draw and you could not ask for more from a cigar. 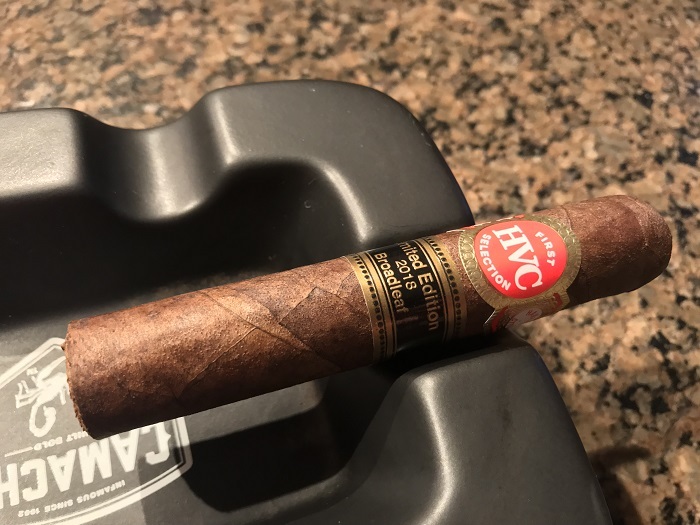 The HVC First Selection Limited Edition 2018 Broadleaf Short Robusto was a spectacular cigar and a beautiful surprise. 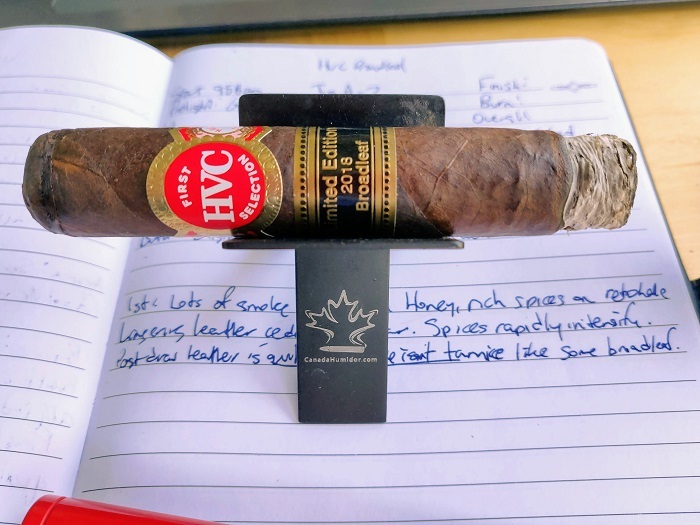 It has been sometime since I have had a Connecticut Broadleaf over Nicaraguan tobacco blend that has smoked like this, and it makes me want more. I have always been tough on Connecticut Broadleaf releases, but it is releases like this that have received my praise. It was full in strength and body, but also full flavored. There was complexity and depth, and the transitioning was fantastic. Construction was perfect and you could not ask for more out of a cigar. It got hot down at the nub, but 90%+ was fantastic. It is great to see a release like this out of the AGANORSA facilities, and I hope to see more like this in the future. 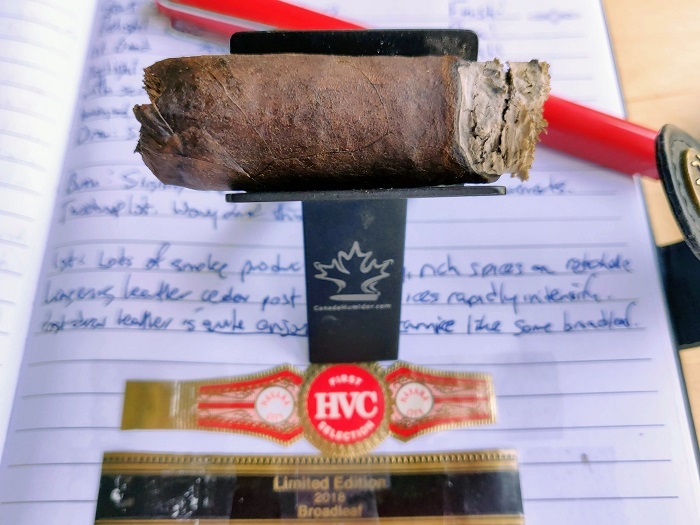 They have shown that they can master tobaccos like Connecticut Broadleaf, Mexican San Andres and Ecuadorian Connecticut Shade over their tobacco, and it makes me hope for a Sumatra release in the future. The draw is into the tight/resistant end of the scale. 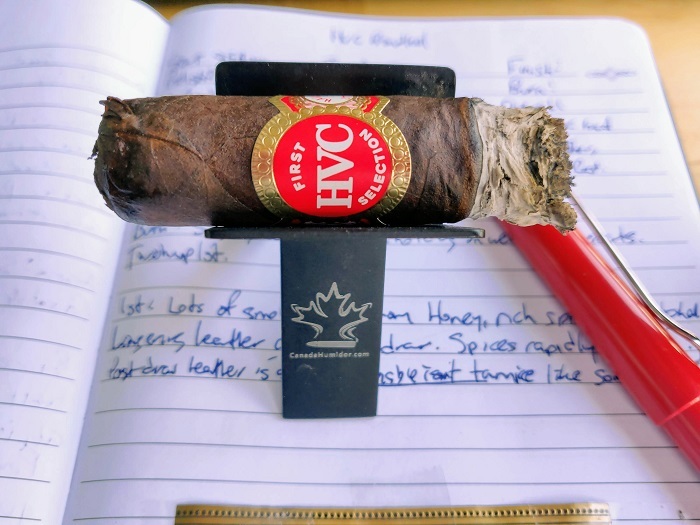 The HVC First Selection Limited Edition 2018 Broadleaf Short Robusto delivers consistent flavors that carry all the way to the nub of the final third. 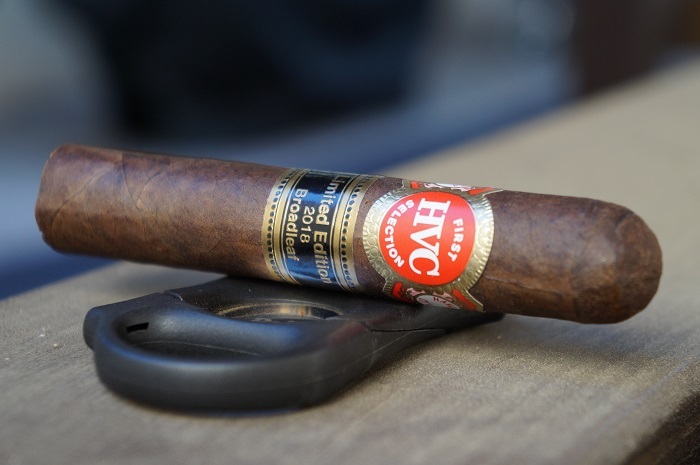 The strength and body of the cigar are both medium-full, with nuances that don’t overwhelm the palate. If you’re a fan of Broadleaf cigars, you’ll want to add this one to your shopping list.